Bolaji Amusan a.k.a. Mr Latin is the governor of the Ogun State chapter of the Association of Nigerian Theatre Arts Practitioners. In this interview with ADEOLA BALOGUN, the comedian talks about his career and his plan to go back to school. You are not an indigene of Abeokuta but it looks like you are in love with the city. How come? My elder brother, who was an army officer, was transferred here in 1973 and I moved in with him. Since then, I have been here. Of course, no. My name is Bolaji Amusan. How did you come about the name Mr Latin? When I started acting, there were a lot of babas in the industry, and I wanted to bring a bit of education into comedy, so I chose to be speaking French even though I was not so good in it when I did it in the secondary school. I spoke it badly and I liked it that way. One day, we were acting and Ola Ogungbe, the elder brother of Akin Ogungbe said, 'This man that is speaking foreign language, is it Greek or French or Latin?' I said it was Latin and the name stuck. You are widely known for your comic roles in movies. How come you fell in love with comedy? I didn't start as a comedian. I used to have a landlord; he is late now. I regarded him as the original Mr Latin. I was very close to him and I always liked to mimic him in the midst of my colleagues. I would ask them to come and listen to what my landlord said today. Then around 1990, my late oga now called me and said, 'Can you mimic your landlord in a film?' I said I could. My landlord used to be a liquor distributor. He was a very nice and blunt man. He always believed that two multiplied by two was equal to four, nothing more, nothing less. Each time he acted funny, he would call me to sit down and learn. He didn't know that I would mimic him then. He just saw me as a young man who should learn one or two things about life. You said your elder brother was an army officer, why didn't you aspire to be like him or become a doctor or a lawyer instead of an actor? I didn't even want to be an actor in the first place. It was just by accident that I became one. All I wanted to become was a footballer, because my brother was a sportsman, a boxer. My role model at that time was Segun Odegbami. I wanted to be like him. Even if I put on any jersey then, it had to be one with the number seven commonly associated with Odegbami. After secondary school, because of my poor background, my education suffered. My parents called me and my immediate elder brother and said we had to go and live with our elder ones. While my elder brother went to Lagos to live with our first born, I had to come to Abeokuta to live with our second born. I was the last born. Because I could not further my education, I had to learn how to repair electronic devices. At the workshop, whenever we were less busy, I would crack jokes and make people laugh. Then somebody called me and said there was one theatre group in their house and that he would like me to come and have a look. I followed him home and when I got there, I saw a lot of actors performing. I then said to myself that I could do better than most of them. I told the producer that I could do it better and he said he would give me a chance. That was in March 1988, about 20 years ago. That was when I started my acting career. Did your elder brothers agree that you should take to acting? No, they didn't. Nobody liked his relations to go into acting then, because actors were seen as riffraffs and ne're-do-wells. I suffered a lot before things began to pick up. Did they ask you to quit? Of course, they did so many times, but I told them I was old enough to know what was good for me. I then promised them that if I found it difficult to make a meaning out of the job, I would come back to them. Later on, they began to see the talent and began to brag that the chap on the television is their mother's last born. Looking back to 20 years ago, how would you say you have fared? Well, I thank God, because I know where I was 20 years ago and where I am today. I am not rich, but I am not poor either. What we hear is that acting alone does not bring food to the table. How have you been coping? All I do is acting. The blessing of God is what we should all pray for. To God be the glory, I can feed myself up to three times a day. I can feed my family. I can travel to any part of the world. In recent times, you have been travelling all over the place, what do you do in these places? It is true. 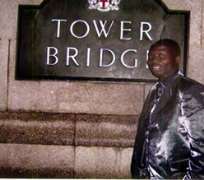 Between January and March, I was in London three times to compere with Shefiu Alao. I was invited and paid. Between March and May, I was in America for a two-man stage performance programme; about eight of us were invited. We visited about 16 states before I came home. In June again, I was in London for an MC job, and in July, I was in Dublin. I always go abroad on holidays, once in a year. But other trips are for shows. It is generally believed that Lagos is the base of acting. So, as the governor of the Ogun State chapter of ANTP, would you say there is much the activities here? It depends on how you look at it. When one looks back to two years ago when I became the governor, we thank God for his mercies. We have been able to put food on the tables of our members by encouraging producers to move their productions down here. As I am talking to you now, I can put you in my car and take you to three or four locations where high project jobs are going on. What other thing have you been able to do as governor? I have been able to link the association with the government in the state, and we have benefitted from many hajj and Jerusalem slots provided by the government. I was one of the beneficiaries. Where did you go, Mecca or Jerusalem? Did you go there to crack jokes? No. I went there to worship. We were able to get a bus from the government. We were able to have a befitting secretariat, unlike what happened before. There is nothing between the two of us. Baba Suwe is my very senior colleague. We are good brothers and I give him his due respect. You see, there is time for everything and everybody has got to use his time fast. Once upon a time, we had Baba Sala; then we had Pa Luwe, then Baba Suwe and then, others. Nobody can push another person out of the market. I am doing my own. My comedy is different from those of other comedians. It is not true that I chased anybody out of market. All I know is that I am doing my own the way I know to do it. I respect my senior colleagues. How do you manage your fans? You see, whatever you achieve in life, you have to be humble and God-fearing. My fans know me. We interact very well because I believe I am not a star. I was only fortunate, because I am not better than most of my colleagues. I have never seen myself as a star. Last Saturday, I was at a show with King Sunny Ade where I was the MC. In one of my films, I joked that the first guitar Sunny Ade had was bought for him by me and that he had not been grateful to acknowledge me. So on Saturday, he referred to it and said he did not know whether I was there to take back my guitar or the money. I felt humbled, I had to prostrate on stage for KSA, because if I call myself a star, what should KSA call himself? I am a vey humble fellow. As a producer, how many films have you produced? Till date, I have done 28 movies. Which is more rewarding; acting and producing? The two are almost the same. There is one thing that has kept us going in ANTP: we always assist ourselves in productions even without fees. Though I read an interview granted by Yemi Solade that Yoruba actors are paupers because of that. I disagree with him, because I am not. There is a tradition in Yoruba, which is called aaro. If Oga Bello calls me to come and act in his movie, I have to honour him as a very senior colleague. Ditto when I want to do my own, forget about the artistes' fees. That has been keeping us going. He missed the point there. Let him face his business. Whenever they call him to act, let him price himself out of the market by collecting N1 million. As far as I am concerned, we are Yoruba and we have a tradition which allows us to help one another. What you are saying is that you can act in a film for free? Why not? We do that a lot. In fact, one of our elders in Ogun State has invited me to his production next week. And apart from acting, he has asked me to bring along N50,000 as my contribution. That has not made us paupers; it is our tradition. No. When I help you by not charging you today, when you sell your film, I expect you to pay me what I am worth, because by then you would have got enough money to settle people. Producing is more tasking because the time you use at location is much. You have to take care of everything. After that, we can talk of post production, then marketing and distribution. As for acting, I only need to take my car, go to a location and read my script and and get out. Do you still follow scripts? Of course, I do. Why not? The only thing I do is to add one or two things, but with the consent of the producer. Not for anything but to make it better. Apart from comedy, do you think you can act any other role? Of course, I started as a very serious actor. Well, that is true, but there are so many forms of comedy. If you want me to act as a gateman, the way I will act will be different from acting as a landlord or a driver. Entertainers are reputed to be notorious with women. To God be the glory, I have never dated any actress in my life. I have a lot of fans and I appreciate them. I love them but I don't date anyone because I have a wife that I cherish so much. You can ask any actor around, they will tell you that Mr Latin does not engage in all those things. I don't smoke, I don't drink, I don't go to clubs. I don't go out of my house after 9p.m., even if I am abroad. I have never left my house and for a beer parlour or a pepper soup joint. If I want pepper soup, I send somebody to go and buy it for me and I eat it in my house. By 6p.m., I close this office, I go home and watch movies with my family and sleep. But what of girls that would want to throw themselves at you? They would, but you turn them down politely. You don't encourage them. I have a lot of text messages and calls from them, but I know how to handle that. Can you tell me about a crazy thing a female fan has done to you? It happened this morning. Somebody just text me and wrote, 'Mr Latin, I want you to be my boyfriend. I love you so much.' You can ask my manager, because I showed him the text. I then called and told her why she did that; after all, I had never met her. She said yes, and I said she should never call the line again. It is because nothing thrills me. I am contented with my wife. I am a practical person and I don't pretend. Oh, my wife? She is a very wonderful person. She is my sister, my friend and my mother. She has always been there for me, and that is why I don't joke with her. We got married in 1999. Was she one of your fans? No. I met her initially in 1996, and I told her instantly that I would marry her. She dismissed it as a joke and we lost contact. In 1998, we met again. Then I did not even recognise her again. She then called me and said, 'oko mi atijo' (my former husband). I asked one of my boys to find out who exactly she was. That was how the relationship started and we got married in 1999. She is an international businesswoman. She travels a lot because she buys and sells. But at present, she is a student at the Federal College of Education. What happened to the relationships you had before then? Well, most of them didn't want me to be an actor because they didn't believe that an actor could ever make it. And one thing about me is that if you don't like the job I am doing, no matter who you are, I will not like you at all. Then a few of them were not sure of what would become of me. They sat on the fence. But my wife was the only person who whole-heartedly declared that if I was the only person on earth, she would marry me, no matter what happened. And for the first three years of our marriage, we could barely afford three square meals. Then she got an offer from an American-based pilot to marry him, but she turned down the offer. Her senior brother is a pilot and because of that, she was nearly tricked into getting married to a pilot based in America. But when she became aware of the plot, she refused and declared that she would not marry any other person but me. She was persuaded to get a passport to travel without telling her the reason. She obtained the passport and that was when she was told about the pilot guy. She vehemently turned it down and stuck to me. Now we joke about it, particularly whenever she wants to travel. She would say the travelling that was used to trick her is what she does as she likes now. Whenever I am abroad, I call home more than seven times a day. As someone who travels abroad a lot, are you saying that you have never had a fling? You see, I hate scandals and that is why you can hardly get something like that to read about me. If I have anything with you, chances are that you may use that to trap me, which will turn out to be a big mess and I hate that. Moreover, what do I want from you that I don't get from my wife? That is why I prefer to lead a very simple life. I am not a born again Christian but I naturally don't like that kind of lifestyle. Yes and no. At the office, I am a serious oga; I don't joke with my work. My comedy life is different from my real life. I am a serious husband and a responsible father. When it is time to joke, we do that briefly and get serious with work in the office. When I get home too, I attend to what I should attend to, play with my family and my wife. How do you then unwind? I belong to the oldest club in West Africa, Abeokuta Sports Club, founded in 1904. I go there to relax and meet people and discuss so many things like politics, acting, anything. Well, who knows? I want to go back to school very soon, maybe next year. I got an admission to the National Open University to study tourism but because of my various engagements, I couldn't go. I got an admission to the Ogun State Polytechnic in 1991 or so to study Public Relations, there was no money. I got an admission to Olabisi Onabanjo University three years ago on a part-time basis to study Mass communication, but then it was not easy to combine it with my job. But by 2009, by the special grace of God, I plan to go back to school. Supposing next year too, you are too busy, what will happen? Well, there is a stage in life when you can say you are a bit well off. I thank God for what he has done for me. I believe that I am comfortable enough to settle down to do something. I tell you that going back to school is the next thing I plan for my life. Why that at this time? Yeah, because there will be a time when a friend of mine may become the governor of a state. There will be a time when a friend of mine may become the president of Nigeria. Even if I want to get an appointment then, if I don't have the certificate, I may get nothing. What I missed in my youthful days, I want to make up for it. I want to have more than a degree and by the grace of God I want to have a PhD. I don't want to look inferior to my colleagues. When we are gathered and people talk about their days at UI, Unilag, etc, I don't want to be the odd man out. Those things may give you headache but when I have my own certificate, you can not tell me to go and sit down. Would you encourage your children to act? Yes but they have to be educated because that is the only thing I missed in life. I thank God for where I am today but I miss education. I am comfortable, I have a job, I have cars, I live in my house but I never had the opportunity to serve my country as a youth corper. That uniform alone to me means a lot. That is why I want to make sure that my children are very highly educated to do what their father missed. You said you have 28 movies to your credit, did you write all the stories? My wife wrote all the scripts. When you watch my movies, you will see on the credit 'written by Ronke Amosan', that is her job, she is a very good scriptwriter. When I am on location, she is busy writing the next story, I only add in one or two things for direction. Just once, then we were short of cast in London. Why don't you encourage her to act or you dont want another man to touch her? No, it is not like that. If the two of us are into acting, who will take care of the children? That is the only reason. What is the next thing to expect from Mr Latin? The next movie from me is titled Government House. As it is common to all my movies, in it I address socio-political issues, I am a social commentator.